Phosphorescent Rubber Keypads | Northpoint Technologies Inc. Many products that use custom keypads are intended for use in low light, and even dark environments. This is achieved by impregnating the custom keypadsthat are used in these products with phosphorescent colors. Northpoint has produced many different styles of these phosphorescent products. 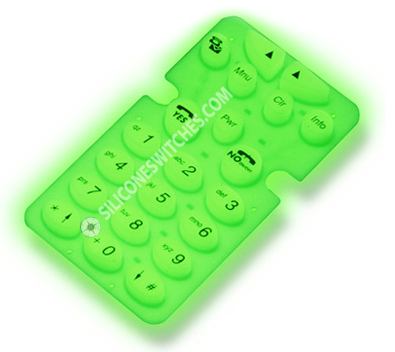 Products for use in night time, stage lighting, and a variety of other industries including mobile devices use silicone keypads impregnated with phosphorescent colors to overcome the challenges associated with low light and dark environments. Ask a Northpoint Technologies design engineer to help you with phosphorescent colors for use in products that require added luminosity in order to perform in low light and dark environments.